Musing about online therapy for depression. A significant body of research has consistently found that therapy in a variety of forms is effective treatment for depression, both on its own and in combination with medication. But what if therapy is not easily accessible? Let’s set aside for the moment the ability to pay (although not a trivial issue by any means), and look instead at physical access. Aunt Dottie living in a remote part of Michigan’s Upper Peninsula may not have a qualified therapist nearby. Depending on her health and mobility, getting to appointments may be difficult (particularly in winter – Upper Michigan snow depths on this day in late January range from 9” to more than 36”). Uncle Henry may live in a warmer, urban area but he is home bound because of a variety of physical challenges. Both would benefit from regular therapy, but cannot access it even if it’s available. The Internet provides an opportunity for access to therapy online for people like Aunt Dottie and Uncle Henry – those who need help, but for one reason or another cannot get it in a traditional face-to-face format. There is a growing body of evidence suggesting that online treatment can be as effective as face-to-face treatment. Internet-based Cognitive Behavioral Therapy has been most studied, but other types of therapy have shown positive results online as well. Of course, online therapy will not be for everyone and raises other types of access issues. Specifically, access to the Internet. This, however, is a declining concern. According to the Pew Research Center 70% of those living in the U.S. had broadband connections at home in 2013. In 2014, 87% used the internet, email, or accessed the internet via a mobile device. This includes 83% of those in rural areas and 57% of those aged 65 and older. This suggestions that many of those who might benefit from online therapy use the Internet currently, and those numbers continue to increase. As a client, would you get therapy online? As a professional, would you provide it? So, what are you doing on your sabbatical anyway? I want to write a book. Period. I love the ups and downs of the writing process. The reading and then thinking on the page. Making messes with words then slowly tidying them up like tapping a stack of papers on a desk to line up the edges. I love those times when I get so absorbed in my work that the timer goes off and I never hear it. I even love the days when 15 minutes seems like forever and my brain is all a tangle. It’s a puzzle and I know I’ll find the right thread to pull eventually as long as I keep showing up. So when someone asks me what I’m doing on my sabbatical, my current answer is, I’m working on a book. They look at me expectantly. I look back at them. They look at me. Etc., etc., etc. Faculty advise doctoral students to have the “elevator pitch” – that 20 to 30 second blurb about your dissertation that you can spout off at the drop of a hat. Oh, Professor Woodward – take thy own advice. Consider this my pitch – for now. Subject to change, feedback welcome. (I’m hoping for slow elevators). If you haven’t been living in a hole somewhere, you know that the population is getting older across most of the world. Most of us need some help as we age and, while informal caregivers are important, we will probably need some professional help, too. But, while the number of older adults increases, the workforce available to meet their needs is shrinking. Not only that, but economic changes are straining health and social welfare systems and everyone is looking for politically acceptable and cost effective solutions. I am comparing how the United States, Finland, and Estonia are addressing these issues within the context of their different welfare systems. All three countries are relatively similar in economic organization, mortality and morbidity, and their exposure to the forces of globalization. And yet they vary in important ways in their historical development, culture, and structure of services. The U.S. is a largely market driven system that relies heavily on private non-profit and faith-based organizations to provide many services to those in need. Historically and culturally there is resistance toward state intervention (e.g., ongoing challenges to the Affordable Care Act), and there is significant cultural heterogeneity. Finland and Estonia are similar geographically, sharing a border and a history with Russia, and have similar languages, belonging to the Uralic family of languages along with Hungarian. They also have similar political structures and social welfare systems with universal health and social services administered largely through municipalities. At the same time, Finland is culturally Nordic while Estonia is culturally Slavic. Each of these countries does some things better than the others. Some of one country’s strengths might be portable to other countries, but which ones? And how much are those strengths embedded in cultural norms that can be easily translated to another country? Ultimately, I hope a combination of population-level data and qualitative interviews with care providers, care recipients, and policymakers can help pull some of this apart. And then I can browbeat policymakers with it. But really, I just want to write a book. 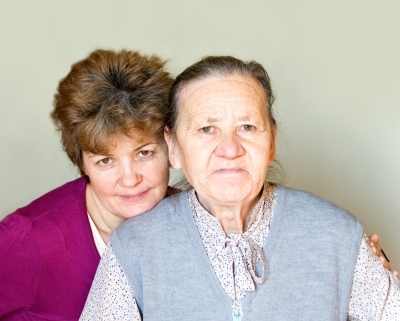 Where do you get caregiving information? Fun with data, Part 2. In 2009, a sample of about 1,400 caregivers reported using a variety of sources for information about caring for their loved one. Frequent sources include the doctor (24%), their informal network (24%), aging services (14%), and a nurse (12%). Interesting, but perhaps not surprising, is that 27% also reported the Internet as a source of information. Five percent or less reported using other sources such as disease specific groups, their church, and the Veteran’s Administration. (Data from The National Alliance for Caregiving and AARP survey Caregiving in the U.S.). Looking at all of the different information sources mentioned, caregivers fall into three distinct groups. The majority (68%, n=956) don’t actually look for much information at all with only a limited use of doctors, nurses, and aging services and virtually no use of other sources. Seventeen percent (n=226) rely almost entirely on their informal network, while 16% (n=215) rely entirely on the Internet for information. 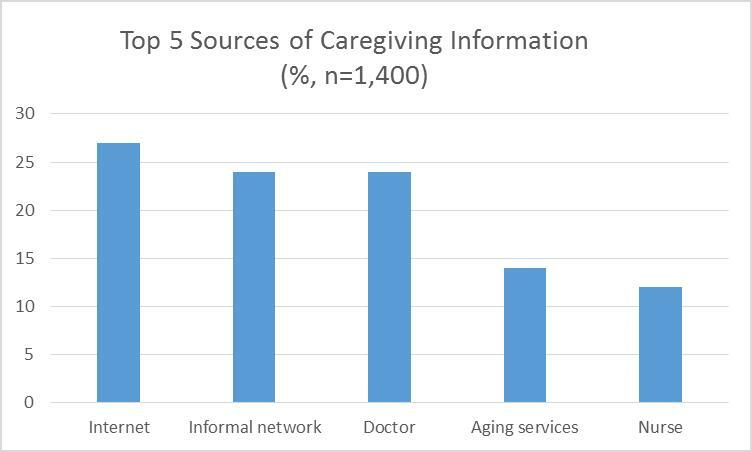 Among those who used the Internet to look for caregiving information in the 12 months before the survey, the majority looked for information on the care recipient’s condition or treatment (78%, n=544), information on specific caregiving tasks (77%, n=540), or available services (53%, n=382). Forty percent (n=274) looked for information on care facilities and 36% (n=257) for information on doctors or other health professionals. Only 9% (n=76) reported looking for caregiver support. 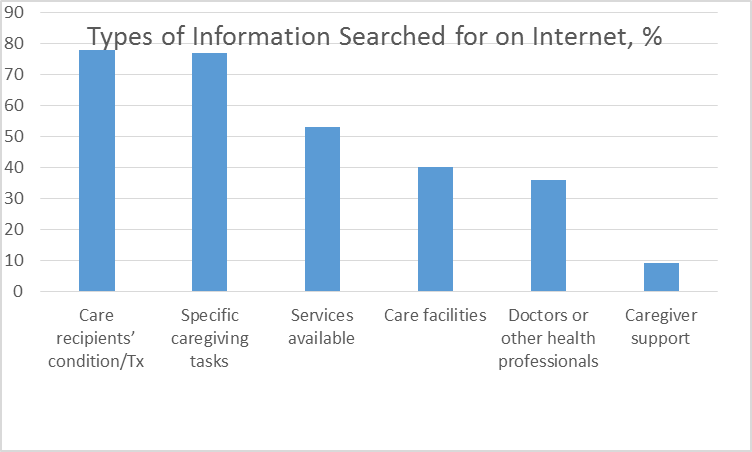 Again, in terms of online information searches, caregivers fall into three groups. Forty nine percent used the Internet, but didn’t specifically look for any of the above types of information and 28% looked mainly for information on the condition or treatment. Another 23% looked for all types of information online with a particular focus on the condition or treatment, available services, and care facilities. These data raise two main questions for me. First, why are the majority of people not looking for more information? There may be any number of reasons, including the possibility that they are getting all of the information they need. But, if you’ve had to deal with the health care system recently, you know that coordinating care for yourself or a loved one can be a full time job. Just at the time when you should be resting and healing, you are running from appointment to appointment; making phone calls to doctors, pharmacists, and insurance companies; and sorting through a deluge of bewildering information at a whirlwind pace to make sometimes life-changing decisions. It is a daunting task at best and for many downright impossible. My guess is that caregivers and patients don’t know where to go for information or are simply too overwhelmed to deal with it. It can be tempting to sit back and do what the professionals say without question. Quality care requires professionals to talk to each other and patients to be informed and actively involved. Second, for those who rely on their informal network or the Internet for information, what kind of information are they getting and how are they evaluating the credibility and usefulness of what they receive? The Pew Research Center reported in 2013 that 59% of U.S. adults looked online for health information in the past year (substantially more than the 2009 numbers above suggest. That difference may be due to sampling or because they were asking about the health of the respondent, rather than someone they were caring for. It might also be, however, that the number of people using online health information is increasing. And, I would argue, that’s not necessarily a bad thing – as long as we are smart consumers and use what we learn to inform conversations with our health care providers. Where do you get your health information? How do you decide what online health information is credible? How do you use that information? Coffee shop experience #1: An older gentleman sat down at my table. He called me Sally and thanked me for getting him out of the house. He told me a lovely story about a goat he had as a child. As we were talking, a woman about my age hurried over with two coffees in her hands. She was his daughter – Sally. She apologized and led her father away to another table. Coffee shop experience #2: A woman at a table next to me talked a long time about a recent decision to move her mom into an assisted living facility. Her mother had wandered away from home twice, once in the middle of a Michigan snowstorm. She was heartbroken, but it had just become too hard on her kids, her marriage, and her job to care for her at home. I imagine these stories have a familiar ring for many. Most of us are caring for an older parent or spouse, have done so recently, will do so at some point, or know people who are. The National Alliance for Caregiving and AARP report that, in 2009, 43.5 million people in the U.S. aged 18 and older were providing unpaid care to a family member or friend age 50 and older. This is 19% of all adults in the U.S. and is expected to rise as the population continues to age. There is a nice report on their 2009 survey, Caregiving in the U.S. , but even better (for nerds like me) the data on almost 1,400 caregivers is freely available . So, I spent a happy, winter afternoon playing with data – a cup of tea close at hand, some dark chocolate covered blueberries, a puppy on my feet, and a cat snoring (loudly!) on the window sill. For today I decided to look at some gender differences. It probably won’t surprise anyone that the majority (67%) of caregivers are women (although the proportion of male caregivers has increased since 1997). Beyond that, however, there are fewer differences than I, at least, expected. Most caregivers live within twenty minutes of the care recipient. More male caregivers live further away than this – some more than two hours. It’s not surprising then that male caregivers visit their loved one less frequently than female caregivers. Despite this, men and women report spending about the same number of hours per week on caregiving (23 for women, 20 for men). At least in this sample, men may visit less frequently, but when they do they spend a fair amount of time in caregiving tasks. The type of care provided is often broken down into Activities of Daily Living (ADLs), which includes personal care tasks like getting in and out of bed or getting to the toilet, and Instrumental Activities of Daily Living (IADLs) – paying bills, cooking meals, providing transportation, etc. There is no difference between men and women in the number of IADLs they help with. Women take care of more ADLs on average, but the difference is quite small and seems to be driven largely by two tasks: fewer men help the care recipient get dressed or bathe/shower. And really, this doesn’t seem too surprising. The majority of care recipients are women relatives (most of those mothers) who are around 77 years old and, quite frankly, may not be comfy with a man (who is not their spouse) helping them with these more intimate tasks. (Only about 6% of caregivers are spouses). Slightly fewer men than women identify themselves as the sole caregiver and more men report that someone else does most of the care, but equal proportions of men and women identify as primary caregiver (about 25%) or report sharing care equally with someone else (about 6%). Some of this may be due to differences in employment status which to me, although not surprising, is more of the more striking differences. More male caregivers work full-time and said they worked at the same time as caregiving, while more women work part-time or identify themselves as a homemaker. A higher proportion of women reported going from full to part-time work or giving up work entirely because of caregiving responsibilities, and losing job benefits as a result. In two earner heterosexual households, the woman is most likely the one making less money so going part-time or stopping work is probably a reasonable financial decision. The majority of people in this sample are married, although fewer women are married and more are divorced, separated, or widowed. For this subset of women, giving up work for caregiving may be particularly difficult. Another important difference to me is that women report more physical strain and emotional stress from providing care, although there is no difference in financial hardship. A higher proportion of women than men also reported that caregiving made their health worse. In future posts, I’ll look more at the type of help people feel they need and some policies and programs that would provide support to these families. In the meantime, share your caregiving stories and questions.